In an election* when the Labor party is in power it is usual for the vote of conservative sitting members in country electorates to increase. 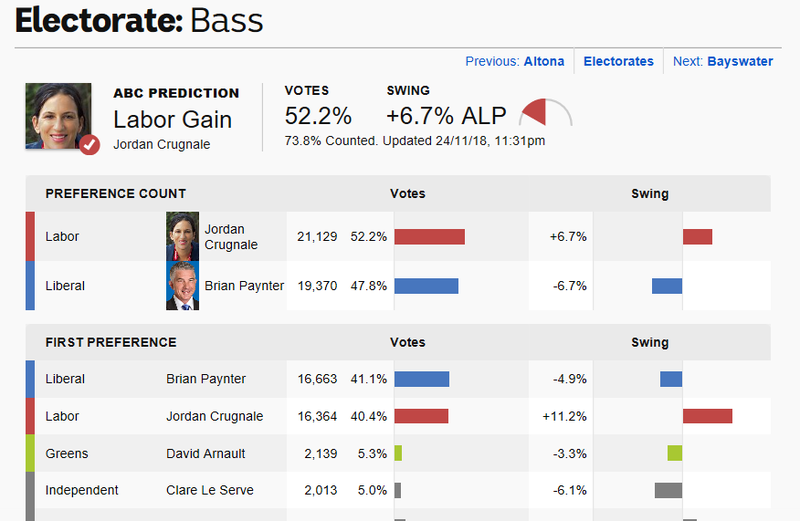 Thus my predictions a week before the election were tentative when I suggested that, with the possible exceptions of Bass and Morwell, the end results would show some swing against the sitting members, but that they would all retain their seats. I was hardly alone in failing to predict the Dan-slide and in Gippsland East there was no swing against the sitting member. Morwell, as predicted, is still too close to call, and currently the ABC Election guide is predicting a win to incumbent Russell Northe with preference flows from National, Liberal and conservative Independents. This is all based on the assumption that voters will follow candidate preferences and ALP’s Mark Richards, who responded positively to our early climate question and clearly led on primary votes, is still very close. Unfortunately the general campaign tended to polarise voters over the ‘renewable energy’ question and the climate friendly Greens and Independent vote suffered. This polarity probably centred around the LNPs opposition, even antagonism, to renewable energy, their decision to abolish the Victorian Renewable Energy Target and the complete absence of anything on climate change in their platform or policies. Perhaps many voters saw this as an either/or choice. In Bass and Narracan there were clear swings to Labor of 6.7% and 3.6%. Climate Independent Clare Le Serve polled a creditable 5% and will get VEC funding. I was one of the few pundits to suggest that Bass could change hands. The Gippsland South polling analysis is also confusing as Labor previously chose not to stand a candidate in the by-election that elected the current sitting member. The ABC suggests a swing of 0.6% to the sitting member, yet paradoxically the swing to the ALP was 5% with a slight fall in Greens candidate Ian Onley’s vote to a still substantial 9%. In Gippsland East alone the vote has not moved though Labor’s Mark Reeves increased his vote 1.4% unfortunately taking votes from the Greens Deb Foskey – the only other candidate to speak clearly about climate change in her campaigning. The sad truth is that the only candidates who can make substantial inroads in these National Party strongholds are very high profile, and hard-working, independents. This will be probably be a peak vote for Labor in Victoria but it will be enough – the solar revolution will by then be unstoppable, if it is not already. And more people will be voting with ‘climate’ in the coming elections as the global warming influenced extreme weather events continue inexorably.